With technology, it is not difficult to enjoy world-famous art pieces with only one click at home. On February 1st, Google launched its “art project”, in partnership with 17 museums in the world. It is definitely a showcase of Google technologies. Users can enjoy art piece by piece. Each museum provides one work for super-high-resolution zoom in. It is quite amazing that you can really appreciate View of the Ducal Palace in Venice inch by inch so that even you can feel how the oil goes on the canvas. Website also provides virtual tour in these museums. According to Mashable, the tech team used a “trolley”, taking 360-degree pictures of galleries. “Google also created an annotation feature that lets you toggle between the museum’s interior and particular works of art. With the connected channel in Youtube, lovers can track further information through videos. If you have a specific interest, creating your own collection in the website, saving views of favorite pieces, making commenting and sharing with friends. However, it raises controversies once the art project went into the public. Controversy #1: Is high-tech really a good way to appreciate art? Some critics say that technology is getting confused with art in the way that do little to advance the cause of either. People holding this view think that this art project misunderstood what people want from art museums and galleries. Nowadays, it is an easy job to find any work you like as long as you type the names into the search engine. What’s the point to go to the museums? Must be something else. Something that Google art project can’t have. At least, it’s not from the computer screen. Controversy #2: Who owns the copy right? Google is “known” for the copyright issues. 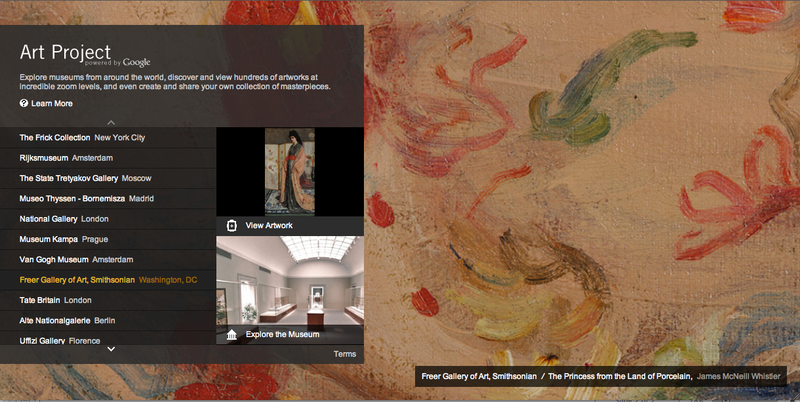 With the advent of Google art project, it throw a new tension of copy right issue. Obviously, there are 4 major players in the arena: artists, museums, google and the public. Most of the works included in the project are from artists who are long dead. Few living artists are seeking legal help, like Koons. As for museums, they control the access. They embrace Google’s project in different ways. Some are warm, while some are holding doubts. With the selected works, Google and partner museums have already considered the problem and chose works in the public domain. However, when goes to the virtual tour, it’s hard to control which piece people will choose. Users can also comment and share images. Who holds the string then? As the project goes on, which Google claims that it will connect with other social network like Facebook and Twitter, the debate will continue.